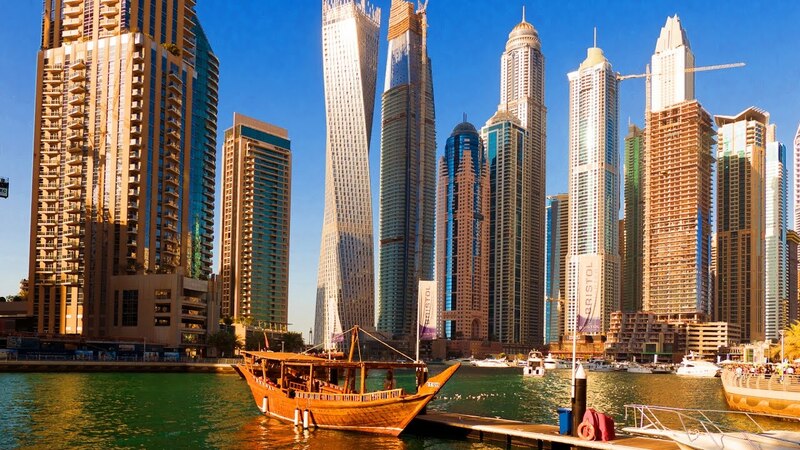 Dubai, the largest and the most populous city in the UAE is a very popular destination for tourists worldwide. It is due to its technological advancements and absolutely unique masterpieces the city has to offer to tourists whatever their demands and expectations may be. The desert country of the sheiks, gold, and oil apparently has a lot more to offer than these clichéd things. The following are 47 different things to do around Dubai for your trip. A trip to Dubai is a waste if you don’t visit this iconic masterpiece that has the world stunned owing to its brilliant architecture and its massive size. 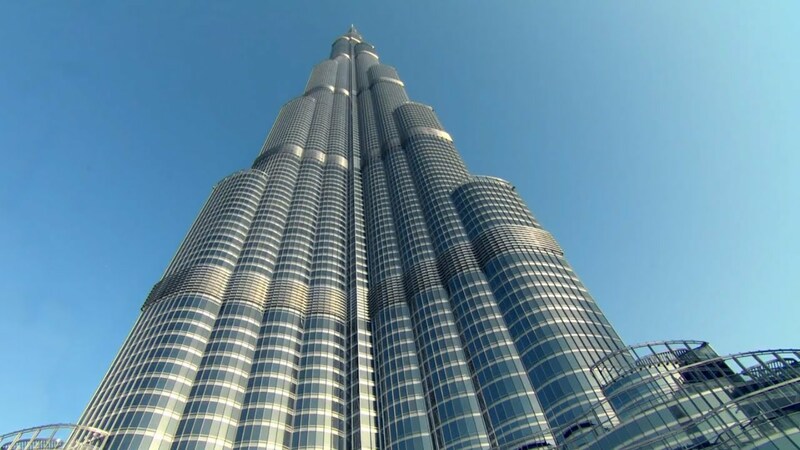 The tallest building in the world is both an architectural marvel and a brilliant masterpiece of art and is worth for an experience of a lifetime. Not going for a Dune Bashing in Dubai is like visiting a beach and never touching the water that makes it totally senseless and a waste of time. Dune Bashing takes you surfing over the sand dunes in luxury SUV’s providing you a great sense of adventure. You can choose any car based on your preference and the money you want to spend. Located in Abu Dhabi, an hour’s distance from Dubai city the Ferrari World is located. The Ferrari World is the first Ferrari branded theme park in the world and also the biggest structure with a space frame ever built. It is home to one of the fastest roller coasters in the world with one of the highest loops and many other adventurous rides and activities to give you a great experience. A seaplane in itself is a very fascinating piece of technology to ride on. 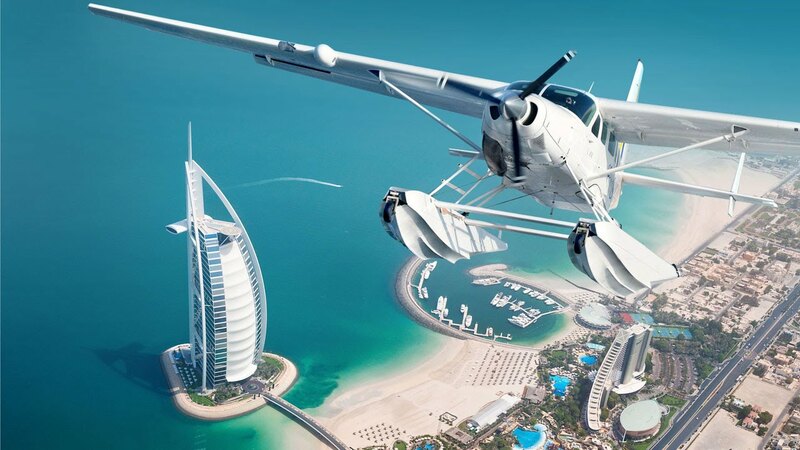 The seaplane starts its flight from the water and gives you an aerial tour of the city in all its magnificence for you to view. Located inside the Dubai Mall, it is accredited as the world’s largest indoor aquarium. It has a total capacity of 10 million liters of water and houses over 33,000 different animals with 200 different species of aquatic animals. 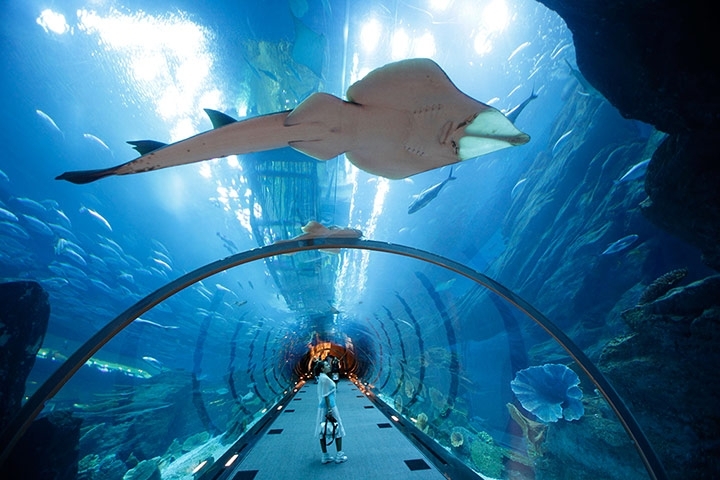 This is one of the world’s most visited aquariums and is world-renowned for its shark and stingray tanks. It is similar to Dune Bashing in the only sense that it requires driving an SUV in the desert. The desert safari is all about enjoying the calmness of the desert and experiences the serene surroundings. You can go in the evening and camp overnight in various fixed camps and enjoy under the sky deep in the desert. The scuba diving in Dubai is much different than that what you are regularly accustomed to. Dubai has no natural reefs of its own, so the diving is more of a wreck diving looking and swimming through many of the shipwrecks that happened along the gulf centuries ago. The place in Dubai with all the restaurants and cafes and a whole lot of brilliantly designed skyscrapers is the Marina. The place is ideal for strolls around the city looking around and enjoying the different eateries and also little shopping can be done here. The only thing that succeeds the walk at the marina is a fancy dinner on a boat that is cruising around the city that is lit up in hundreds of colors with a skyline as high as the sky. The dinner cruise may be replaced by a simple cruise around the city and that would be similar in experience. 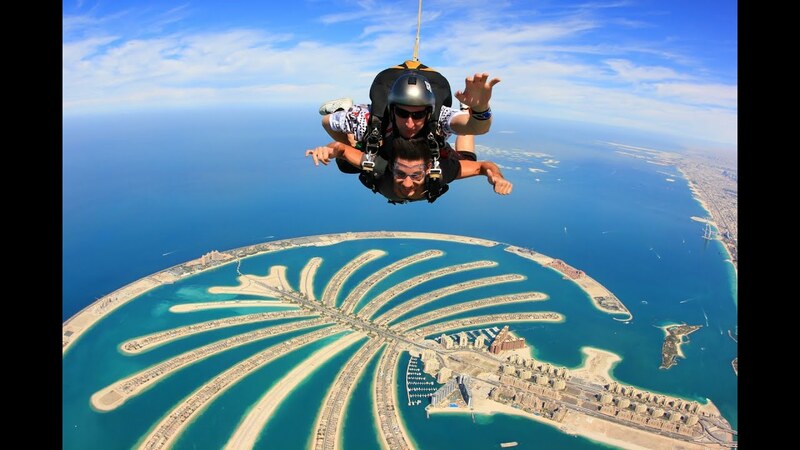 Adding some adrenaline rush to your sweet and calm trip is the skydiving. It is done all year round and provides a boost of adrenaline in your veins making you feel at the top of the world. The skydiving other than the adventure also provides the most fantastic view of the city and the skyline. Yes, you read it right! 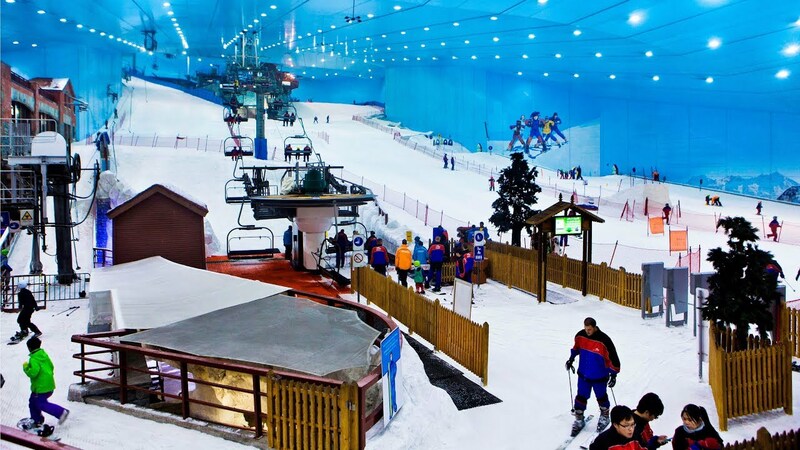 Dubai is home to the first indoor ski resort in the Middle East based on the theme of a mountain. This is the perfect place to cool off the heat of the city and the place is open throughout the year so you can enjoy skiing inside the park while there 50 degree Celsius outside. 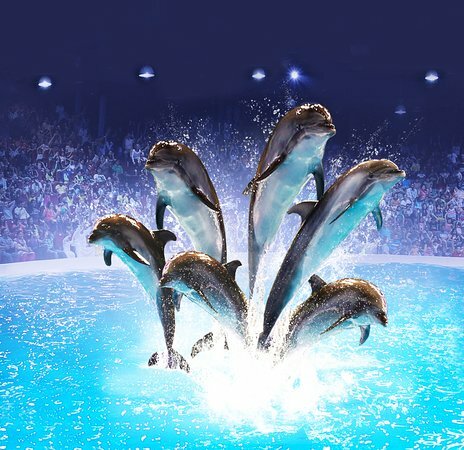 The place features cute and intelligent dolphins and playful and adorable seals showcase marvelous tricks and shows. You can either attend a public show or you can swim with the dolphins and seals and play with them in the presence of an instructor. 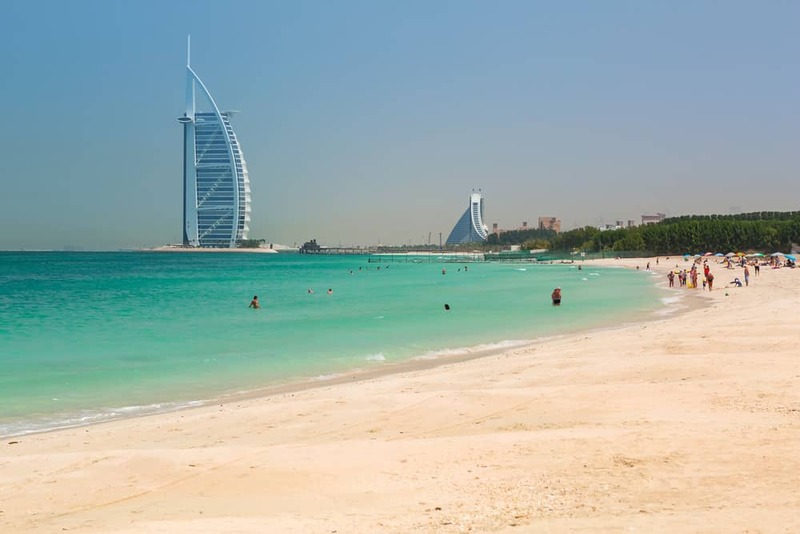 Not all beaches in Dubai are free and open to the public since most of them are owned by big hotel chains and companies. The Jumeirah beach provides you the time of relaxation on the beach at one of the most beautiful cities in the world. Burj Al Arab is the only classified 7-star hotel in the world and it is located in Dubai. Hop in the hotel’s coffee shop for some tea and enjoy the elegance and the luxury of the only hotel of its type. Being a hotel of such grandeur, it requires a reservation in advance and does come at a price depending upon what you order. A popular attraction as well as a fun activity, the hot air balloon ride is a must. Starting from the desert, this ride takes you to an aerial tour of one of the most beautiful cities in the world. Another adventurous and adrenaline-rich activity on the list is hydro flighting. It is the closest to a jetpack that you can experience today. The activity uses water propulsion through jetpack like suits making you fly in the air much like a jetpack. The Dubai Mall is the largest mall in the world and is much bigger than it sounds and you might need a map to navigate inside the mall. The mall looks more like a city housing the world’s biggest aquarium and an uncountable number of shops ranging from the most expensive luxury brands to the basic budget brands available. It is the ultimate destination to shop in Dubai. Another water-related activity but a little less adventurous, Jet Skiing is a fun activity for the less daring and you can go exploring the beach on the jet ski that you can hire from the local shops on the beach. An older district in Dubai, it is an old neighborhood in Dubai with narrow roads and a housing complex. A part of the neighborhood was destroyed to make way for more advanced projects but later the rest was conserved. This neighborhood gives you an idea of the architecture style and the living conditions of a local person back in the 1800’s. 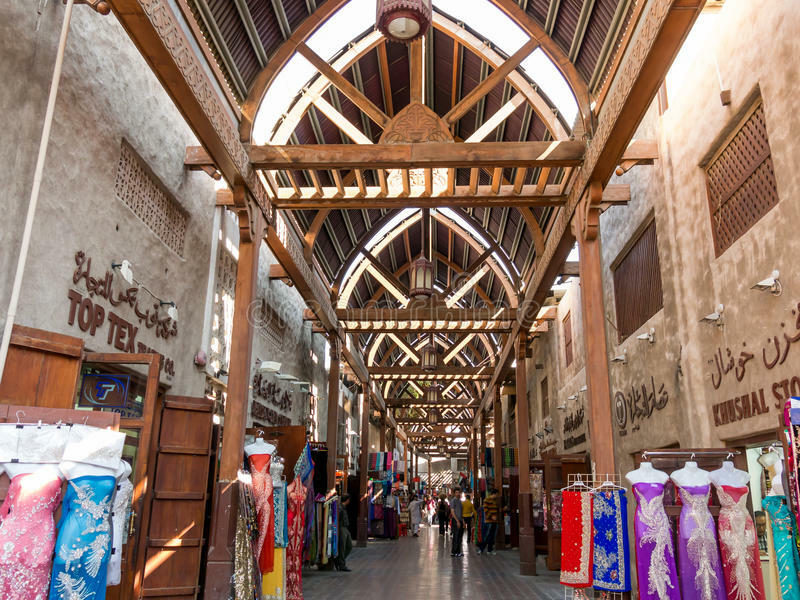 A must visit destination for your Dubai tour is Old Souk. It is an old-fashioned market with lots of things on sale mostly clothes and spices. Another thing for sale is ‘Gold’ for which Dubai is very famous around the world. You can get gold at very cheap prices but must be beware of counterfeits. 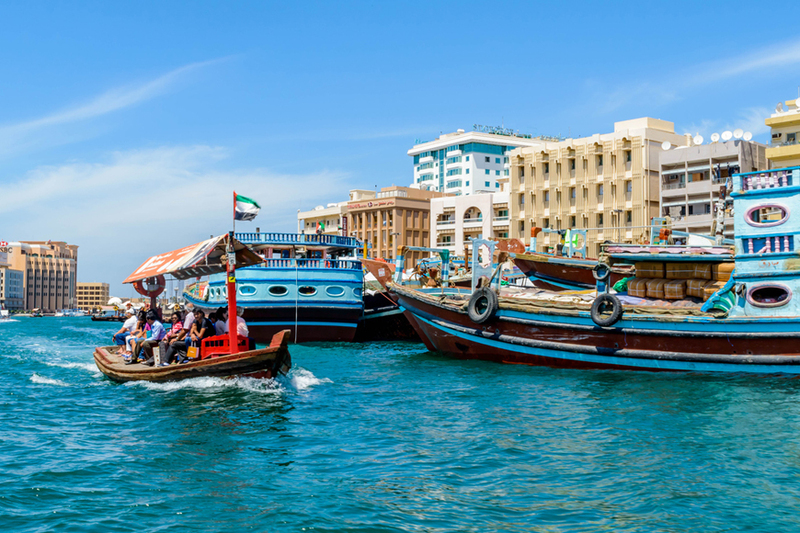 The Dubai creek is most commonly known for its ‘Abra’ rides. Abras are nothing but a less fancy boat that has been dominating the Dubai Creek for a number of years taking passengers and tourists to the Old Souk at very cheap prices. The Dubai Miracle Garden is a flower garden that was launched on Valentine’s Day in 2013. The garden occupies an area of over 72,000 square meters, making it the world’s largest natural flower garden. The garden opens for a particular period every year and is a spectacle to watch if you are lucky enough to visit the garden when it is open for public. With more than 5million visitors annually, the Dubai Global Village is regarded as the largest tourism, shopping, and leisure project. The place offers everything from shops to a theme park to a number of food options, whatever you may like. Every evening, the fountains outside the Dubai Mall perform a coordinated show which is a great spectacle to watch. The fountains seem like dancing with various changes in the flow and the accompanying lights. The fountains are a must do free activity in Dubai. A thing you should always remember while visiting Dubai is the availability of these buses which take you on a sightseeing tour throughout the city at a very nominal basic charge. This is much better than the overpriced private tours and also comes with a guide. UAE is a Muslim country and hence you are bound to find a number of mosques everywhere throughout the city. Though hiding in plain sight from outside, these mosques have one of the finest art and architecture on the inside. Ride on the camels and get lost in the peacefulness and the serenity of the desert on a camel safari. The camel safari is not only a fun activity but also provides a first-hand feeling of how the early settlers used to travel through the deserts without the technology. 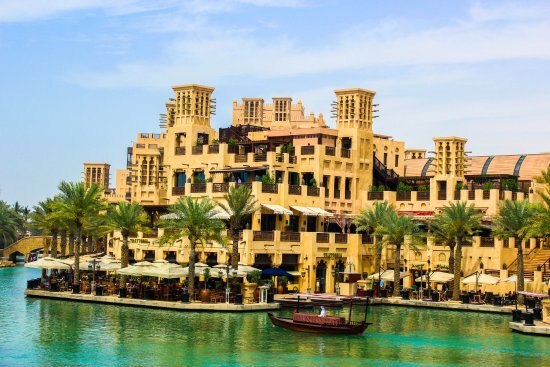 One of the most beautiful places across Dubai is the Madinat Jumeirah. It is a modern recreation of ancient Arabia with architecture resembling the city of Arabia from the Tales. It is also famous for its markets which have numerous shops and also many luxury hotels in the area. 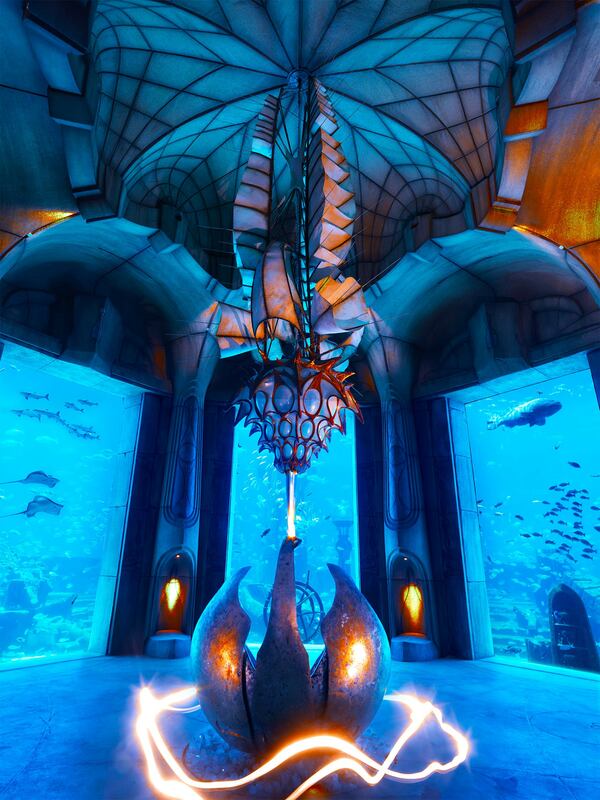 There are a number of underwater restaurants in Dubai that offer you once in a lifetime experience of diving underwater. These restaurants offer clear glass panels on all sides giving you a view under the ocean while you dine. If skateboarding is too mainstream for you, Sandboarding might be your thing. Sliding down on boards from the top of sand dunes is extremely fun and adventurous but also safer than cycling on a busy street. The activity is a must try and also very cheap to go and can be coupled with the desert safari. The largest frame in the world is an architectural marvel which is 150 meters tall and is shaped as a photo frame. The place not only provides a view of the beautiful skyline but also has transparent glass flooring in some places making you look 150 meters to the ground. It is an outdoor water park in Dubai which is owned and operated by Jumeirah International. It is an open water park which is a perfect spot to lose the heat of the desert and spend some leisure time with your family or friends. The park also houses restaurants to feed you after a day of water sports and slides in the park. 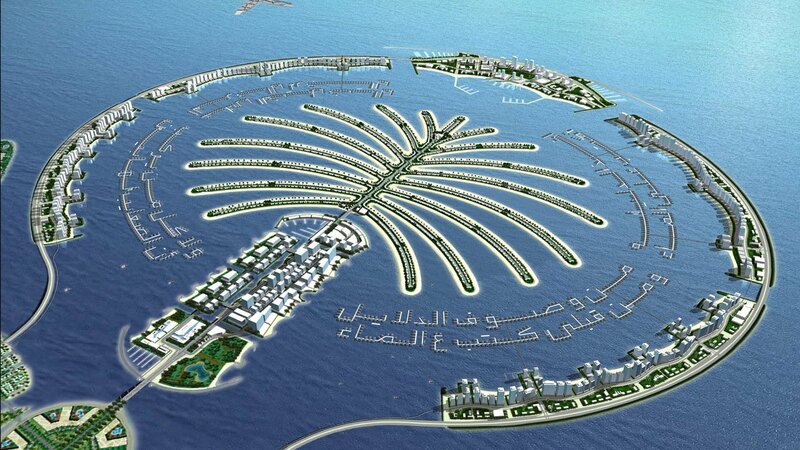 The Palm Islands are a set of two artificially made islands that are shaped in the form of a palm tree. It is a very well known place throughout the world due to its shape and the quality of work done on it. You can tour the island by hiring a speedboat and look at the major attractions in its vicinity. 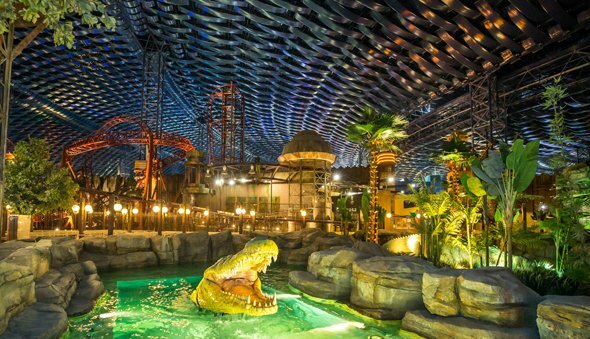 IMG Worlds of Adventure is an indoor theme park in Dubai which is associated with the top brands in the world such as the Cartoon Network and Marvel. It provides many thrilling rides and roller coasters and also gives you a chance to click photos with your favorite Marvel character lookalikes. This historic building served as the former residence of one of the old-time rulers of the Emirates; Sheikh Saeed bin Maktoum Al Maktoum. It is a place of great historical importance and is popular among the tourist. The building open to tourists has been converted into a museum housing historic photographs, documents, and vintage furnishings from the 1800’s. This place is very popular among the Indian as well as the international tourists and travelers and is an ideal place to be for a Bollywood lover. It is like a Disneyland for Bollywood and is the first theme park opened with this theme. It has twelve rides based on Bollywood movies and five different Bollywood themed zones. A gurudwara in Dubai is definitely a place to visit. It is very large and has multiple floors dedicated each to prayers and the Community Kitchen. The custom of Community kitchen is followed even in Dubai with a separate floor for the ‘Langar’ which has a capacity of feeding 5,000 people at one time and is open 7 days of the week offering free food to everyone who visits. 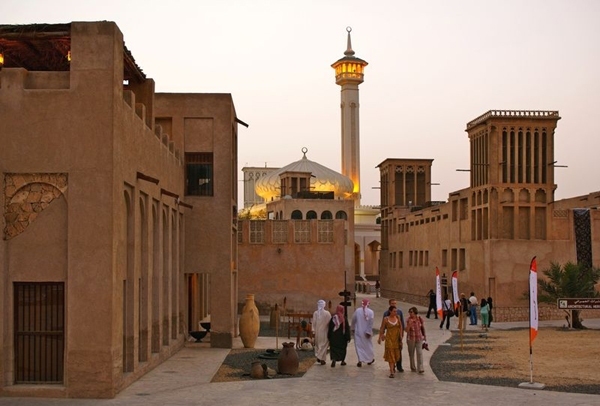 Located at the outskirts of Dubai, the Hatta Heritage Village is a place you must visit. It gives you a look at the traditional lives of the people of Dubai. The people living here were particularly farmers and handicraftsmen in the olden times. This place offers a deep look to the traditional way of life the people used to follow before the development and the modernization took place. 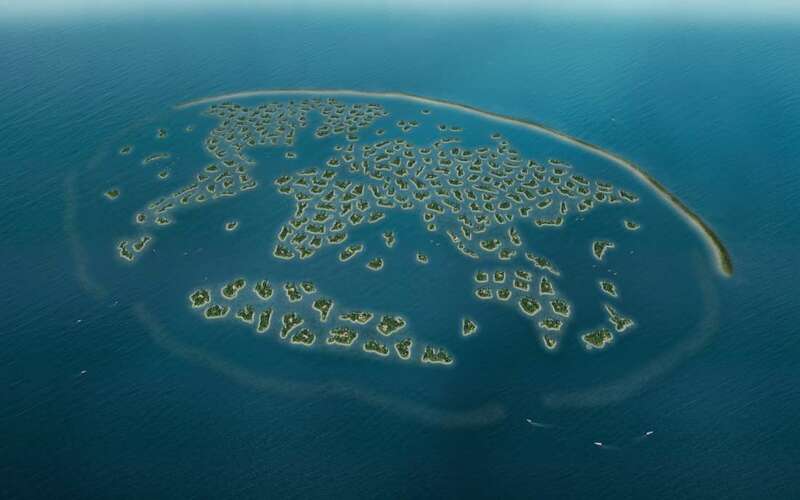 As the name suggests, these are artificially made islands grouped and made together to look like the world map. These islands were completed in the year 2008 and have since been up for lease/rent/purchase. Since the previous options are very expensive, the islands also provide a great view if you visit them on a plane and can visit them during the aerial tour of the city. Located across the Al Manara Road junction, the beach is a place as the name suggests, a hub for kitesurfing. the beach is open to tourists throughout the year and has many watersports provisions for the tourists to enjoy. The soft sand on the beach makes it an ideal place to sunbathe and relax in the sand. Located at a close proximity to the Hatta Heritage Village, this is one of the most popular one-day getaways from Dubai along with the Heritage Village. These are series of pools that are fed by the water from the narrow canyon passages lined with little waterfalls. It provides a mountain scenery at a close proximity to Dubai. This government reserve offers the tourists a multiple days trips through the 9 Deserts in Dubai. It is an initiative by the Dubai Government to make the travelers aware of the traditional Bedouin lifestyle which involves camping in the deserts, traveling on camels etc. It also offers other things such as falcon shows and many other local activities. A trip to Dubai will be incomplete without visiting the Dubai Opera which is located in the city’s Downtown. It is a wonderful piece of architecture and a great medium for artists to reach out on a grand scale. Many Operas, dramas, jazz, live concerts are held here and the opera is usually occupied throughout the year and is a must place to experience. One of the best places to visit if you are a history buff and want to explore the history of the country. It is the best place to look at the country’s history with historically accurate and extremely well-documented archives, some of the most iconic and personal items, masterpieces that belonged to the Founding Fathers of the country. 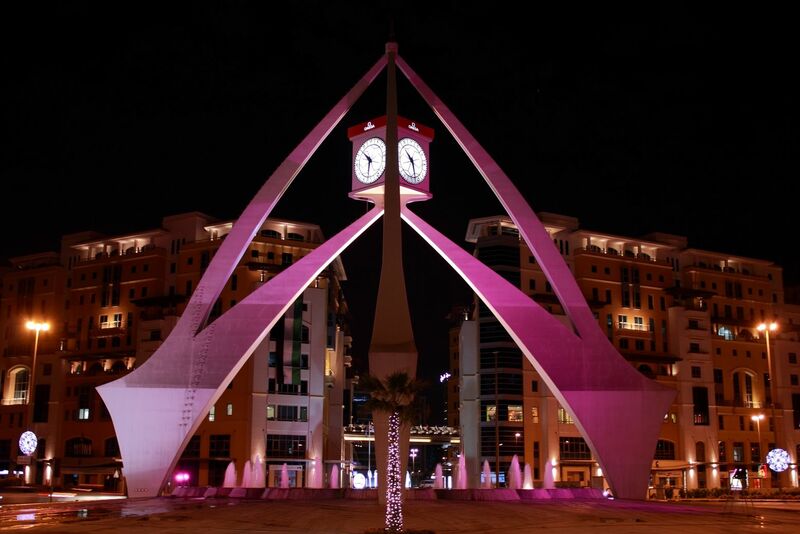 A major landmark in Dubai, the Deira Clocktower is believed to have been designed and built by the people that lived in this area of Dubai during the 1960’s. It came into existence as a symbol of Dubai’s life and the Telegraph Newspaper lists it as the prime attraction in Dubai and one of the 17 most beautiful clock towers around the world. This is an aquarium portraying the Atlantic Theme with numerous underwater halls and tunnels housing many different species of marine life. The place is special as you can have the behind the scenes experience of the aquarium by joining the cultural experts as they take care of the animals and maintain the aquariums life. 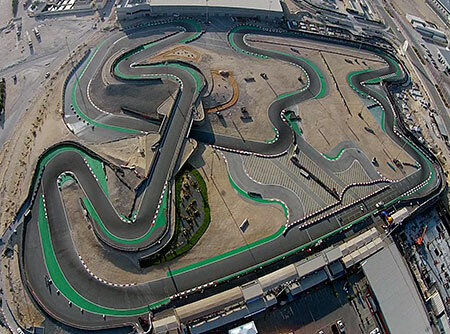 Located inside the Dubai Autodrome Complex which is an international racing circuit which has hosted the Grand Prix and various other international racing tournaments. This is the place to uncover the racer inside you and race a car on the circuit. You can get all your favorite cars and drive them through the tracks and experience the adrenaline rushing through the body. These are some of the best places to visit in Dubai that you can visit on your next trip to the city. These places are the best suited for tourists and are bound to give you one of the best experiences of your lives.